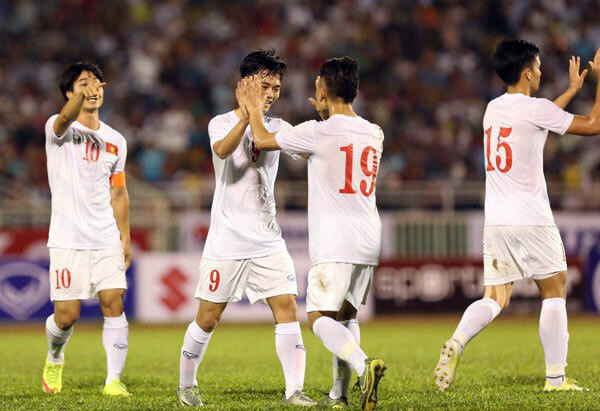 Ho Tuan Tai, Nguyen Van Toan and Nguyen Cong Phuong scored for the hosts. The Malaysians tried hard but failed to break Vietnamese defense in front of a big crowd of local fans at the Thong Nhat Stadium. Tai scored the fastest goal of his career and the fastest goal in Vietnam’s history, finding the net within the first minute. The striker stole the ball from a Malaysian defender to score a facile goal in the 40th second of the match. The goal encouraged the team, which dominated proceedings and scored a second goal two minutes before the break. Phuong who was presented the captains band for the first time for the U23 squad, made a smart pass to his Hoang Anh Gia Lai FC teammate Toan in the box. Toan easily converted the chance. Phuong completed a perfect night near the end of the match with his own goal. Receiving a ball from midfielder Do Duy Manh from the left wing, Phuong took the ball and left five Malaysians behind before tapping the ball into the far corner past goalkeeper Ahmad Syihan Hazmi Mohamed. Malaysia also had their opportunities but their strikers were not sharp enough to convert them. The friendly match is part of both teams’ preparations for the coming Southeast Asian Games. Vietnam wants to win their first title, while hosts Malaysia look to keep it at home./.